BLOOD FOR STONE HAS ARRIVED! I’m proud to announce that my fifth novel is available for standalone purchase. Many of you will remember that Blood for Stone was featured in last year’s bestselling box set Dominion Rising, but now you can get it on its own. The best part is, the price is set to 99¢ for a limited time! 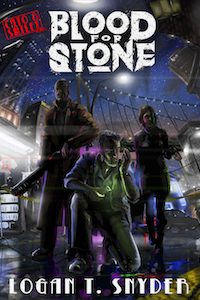 Blood for Stone is the first in a planned series of novels featuring Ryen Cato and Hank Smiley, two special investigators (“spectors”) who work in an alternate Earth of perpetual night alongside vampires, gargoyles, and other humans. While the three species share a nominal peace, the conspiracy that Cato & Smiley discover could tear the city state of Meridia apart and reignite the wars that ravaged Earth for hundreds of years before. Blood for Stone is available now exclusively from Amazon. Subscribe to my mailing list for updates, giveaways, and more. Content Copyright © 2018, Logan Thomas Snyder.